CINCINNATI -- A crew working to abate asbestos in Music Hall stumbled across something interesting beneath the orchestra pit -- human bones. The bones were discovered March 29 by Aztec Services Group employees. Archeological group Gray and Pape examined the bones and confirmed that they were human skeletal remains, they said in a press release. The archeologists also identified six grave shafts with wooden coffins in the same area. "It’s hoped that further analysis of the remains, as well as historical research, will reveal more details about the lives of those found beneath Cincinnati’s Music Hall," they said. A spokesperson from 3CDC said Gray and Pape estimated four people were found in music hall: An assortment of arm and leg bones were found in one area. They also estimated that the skeletons were moved from their original graves during the orchestra pit's construction in 1928. 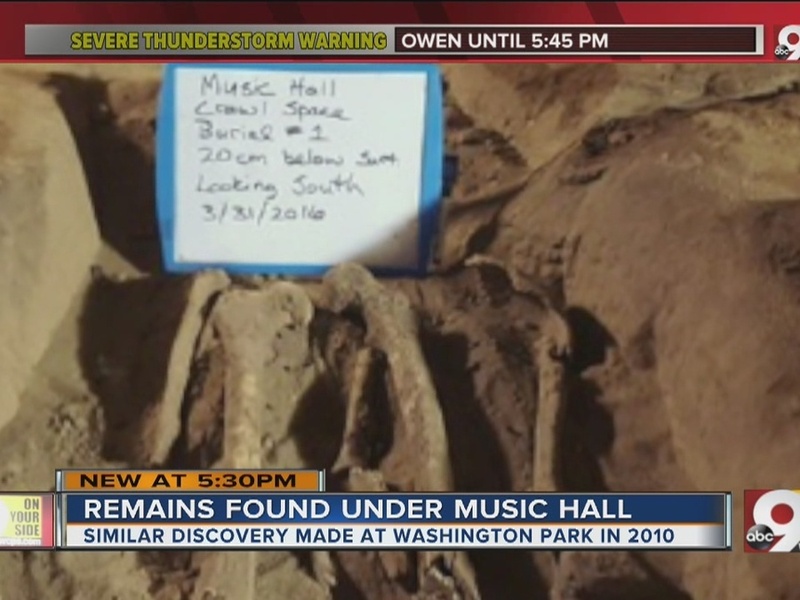 The bones discovery isn't a sign of foul play, however, the archeologists said; Music Hall's history is diverse and, at one time, was a resting place for patients and soldiers. Before the actual construction of Music Hall, part of the property west of Elm Street was a "potter's field" or public burial ground beginning in 1818. This was the case for at least 20 years, the archeologists said. In the 1830s, following a cholera outbreak and massive flood, an influx of orphans in Cincinnati called for another orphanage in the city. The property's new owner (who did away with the burial ground) built a three-story building to house the Cincinnati Orphanage Asylum. Gray and Pape archeologists said "it is unknown how, or if, the existing graves were dealt with before construction." Records obtained by the archeologists said children who died in the asylum were buried in the original graveyard on the property but were moved to Spring Grove Cemetery in 1850. For the next 20 years, the space that would become Music Hall changed owners to become Sangerfest Hall, also called Exposition Hall. It was condemned in 1875. At its peak between 1860 and 1900, the neighborhood was populated by 75,000 people, densely packed into tall, narrow buildings. Over-the-Rhine became home to 18 breweries that employed about 5,000 people. Construction of Music Hall began in 1876. "Almost immediately, construction workers came face to face with (the propety's) past," Gray and Pape said in an email. "As the work continued, countless additional remains were uncovered. The findings drew attention from the general public, and there are reports of bones being removed by onlookers and medical students. Others were crumbled or crushed, and the remainder were sorted into dry goods boxes." The archeologists said 18 boxes of human remains were brought to Spring Grove cemetery. During a second phase or construction, workers again discovered human remains on the property. "In the 1920s, while digging a foundation for a tunnel, workers uncovered a mass of bones," the archeologists said. "The bones were removed and re-interred in a new elevator shaft being built at that time. These same bones were uncovered yet again in 1988 during an excavation for a new elevator shaft." The next discovery was only a few weeks ago. In a project co-operated by 3CDC and the City of Cincinnati, Music Hall will undergo further updates and construction. Aspects of the project include pouring concrete on a mezzanine, finishing in-slab rough-ins, excavating structural footings, column reinforcement and asbestos removal, according to 3CDC's website . Music Hall is open for performances until May 2016.